October at the Trance Cafe – Newcastle and North East Hypnosis Practice and Supervision Group is Drop The Emotional Baggage – Wednesday October 7th. This October, The Trance Cafe session facilitated by guest presenter Alan Scott is Drop The Emotional Baggage. 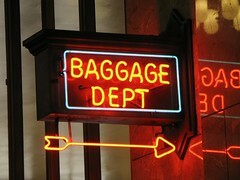 Metaphorically we carry baggage around all the time in the shape of Experiences, Memories and in particularly emotions. So as the summer holiday period comes to an end, we have all had some experience of checking in baggage at airports or loading the car up with our worldly possessions to go on holiday. Have we packed too much? It’s surprising isn’t it how much baggage we carry around with as opposed to what we actually need. How good would it be if you could sort out our emotional baggage as we often do with Airport luggage? Reducing it to that which is useful and relevant, taking out and storing unnecessary items. how much easier would it be to continue our journey and adventure through life not being weighed down by that unhelpful baggage? This Trance Cafe practice group meeting will facilitate an exploration into identifying the things we need and that are helpful as well as cutting any unwanted emotional ties.